Our Bowling alley features 12 lanes of either cosmic or traditional bowling. The alley has a full service bar along with a seating area that can hold up to 40 people. We specialize in bowling parties for all occasions and can accommodate groups of 18 - 72 bowlers. We also have bowling leagues year-round here at Fern Hill. We have a full service bar with TVs to enjoy the game while you bowl and Michigan Lottery Club Keno. If you get hungry while you're here, you can order some food off our bowling menu. For more information regarding bowling parties or to check for available dates send us an email at Bowling@fernhillgc.com. To start a league of your own or to join one of our popular house leagues call us at (586) 286-4700. 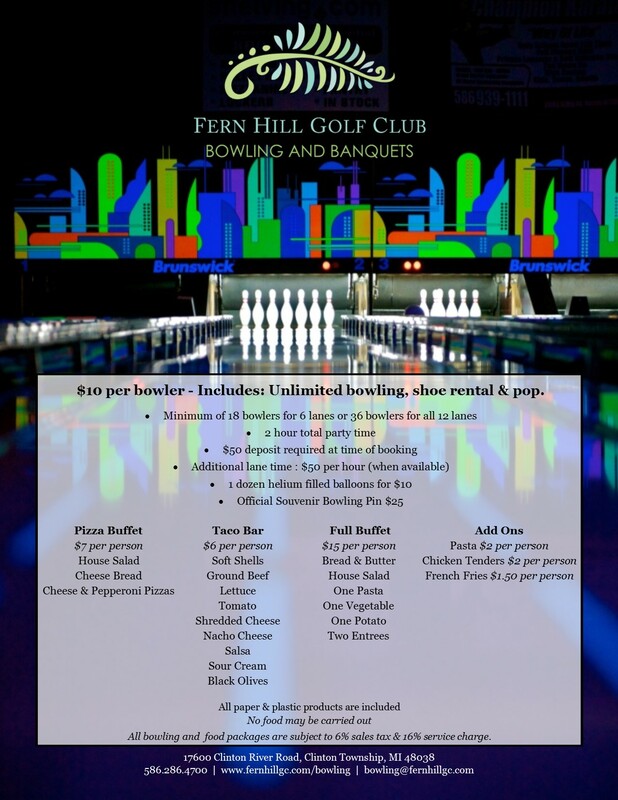 "Cosmic Bowling at Fern Hill is the perfect party spot"